We live 30 miles from everywhere. Public transportation, biking to work, and living with just one vehicle are not viable options for us. And last week, gas prices hit an all-time high of $4.40 in Minnesota. In just a few days, we saw the price of gas jump by 40 cents a gallon and became second only to Hawaii for the cost of gas. This week, the price of gas is down slightly – about $4.25 a gallon where we live – but it hasn’t made budgeting any easier. In fact, the price of gas is killing our budget. I know that there are all kinds of ways we can save money on gas. We’re doing what we can to make sure we’re using our vehicles efficiently, but when gas prices reach record highs, you have to start getting creative. The easiest way to save money on gas is to stop going to town as often. The internet helps tremendously with this. I can shop online for just about everything I need. I take advantage of online banking and online billing. I try to take care of whatever business I have via e-mail and telephone. I borrow books from the Kindle Lending Library or my public library online. Instead of driving into the clinic, I can e-mail my doctor or do an e-visit. We try to grow some veggies in our garden to save money on groceries and to save trips to town for fresh produce. When work and kids’ activities make a trip to town unavoidable, we make sure to make the most of the trip by running other errands while we’re in town. Find ways to bring in extra money. If you can’t cut an expense, then the only option is to increase your income. That can be a challenge when gas prices prohibit you from leaving your house! You can take surveys online to make a little extra cash. You can sell things on eBay (and avoid the post office by printing your postage at home). You can make a few extra bucks on Fiverr. Or you can create some freelance income by posting your services for hire on sites like Odesk. If picking up some extra work isn’t an option, check to see if your boss will allow you to become a telecommuter. It’s not fun to spend to spend $70+ to fill your gas tank. It’s downright painful. But try not to get discouraged. Gas prices will go down again (eventually). Chances are you have more to be grateful for than you realize. Just keep saving when things are tough. 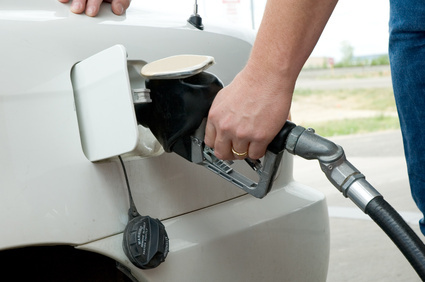 Your turn: How are you dealing with high gas prices? I am seriously considering increasing my workouts to include a 7 mi bike ride to and 7 miles back to go to my fitness classes. Love my classes so I don’t want them to go away. I might just end up training for a Tri because of gas prices. LOL! That would be pretty impressive! You would really be in shape!